‘Sealioning’ is a common trolling tactic on social media – what is it? There are times in life that you know something when you see it. In competitive sports, a very talented player usually stands out above the others. I can identify within seconds whether I will dislike the food at a restaurant based on the smell. Social media has become a significant part of the daily landscape of society. There is interaction, information-sharing, debate, discussion, vitriol, harassment, and a lot of people exhibiting the Dunning-Kruger Effect. As I previously noted in Forbes, the Dunning-Kruger Effect is “a psychological concept that people believe they know more about a topic than they actually do (or conversely misjudge how much they do not know).” You probably didn’t know it was a formal “thing,” but you know it when you see it. This week a former graduate student from my Department at the University of Georgia introduced me to the term “sealioning.” Upon learning what it means, I realized that it happens a lot on social media, especially to scientists. What is it? For more insight, I asked Dr. Pete Akers to explain since he exposed me to the term. Akers is a scientist at Géosciences de l’Environnement, Grenoble. He said via social media, people who troll online by pretending to ask sincere questions, but just keep feigning ignorance and repeating ‘polite’ follow ups until someone gets fed up. That way, they can cast their opponents as attacking them and being unreasonable. It’s pretty common on comment sections of weather blogs re: climate change. 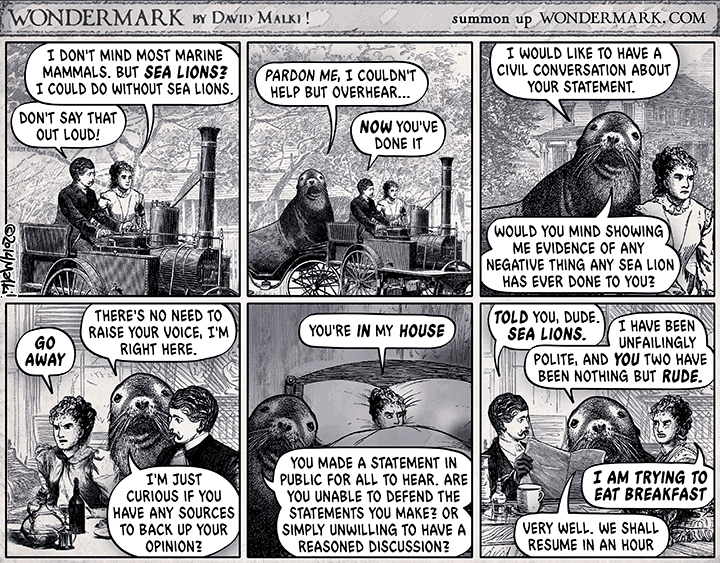 It’s called ‘sealioning’, and the term is based on this lovely comic. Rhetorically, sealioning fuses persistent questioning—often about basic information, information on easily found elsewhere, or unrelated or tangential points—with a loudly-insisted-upon commitment to reasonable debate. It disguises itself as a sincere attempt to learn and communicate. Sealioning thus works both to exhaust a target’s patience, attention, and communicative effort, and to portray the target as unreasonable. While the questions of the “sea lion” may seem innocent, they’re intended maliciously and have harmful consequences.